A set of photographs of Taiwan's red brick "U" shaped courtyard farmhouses and temples. 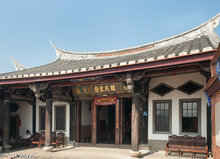 Known as "san ho" or three-sided structures, their distinctive swallow tail roofs are in the classic Chinese architectural style. Many of these buildings are falling into disrepair. The Taiwan government is finally providing financial support to help maintain some of the most architecturally outstanding examples.